architecture, planning, arts and crafts. 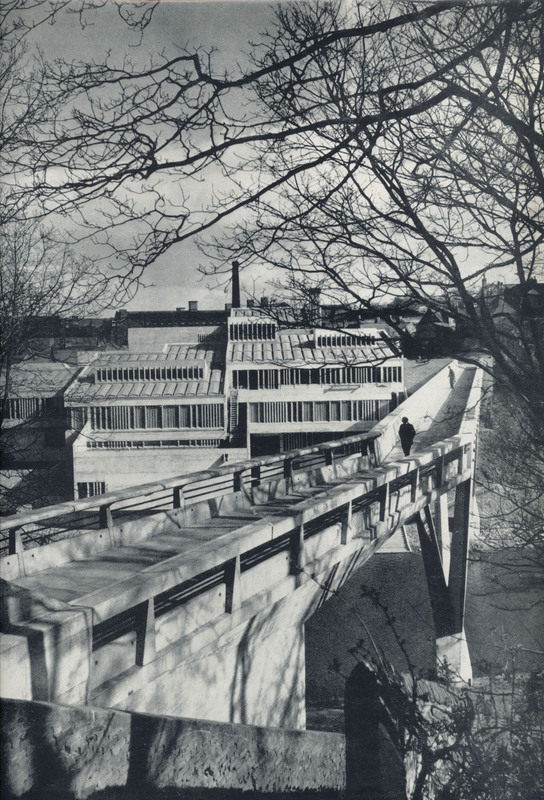 One of the most sensitive and cleverly designed structures of recent times, Kingsgate Bridge by Ove Arup was built in early 60s and was soon joined by a notable neighbouring building, Dunelm House where Ove Arup Associates also acted as structural engineers. 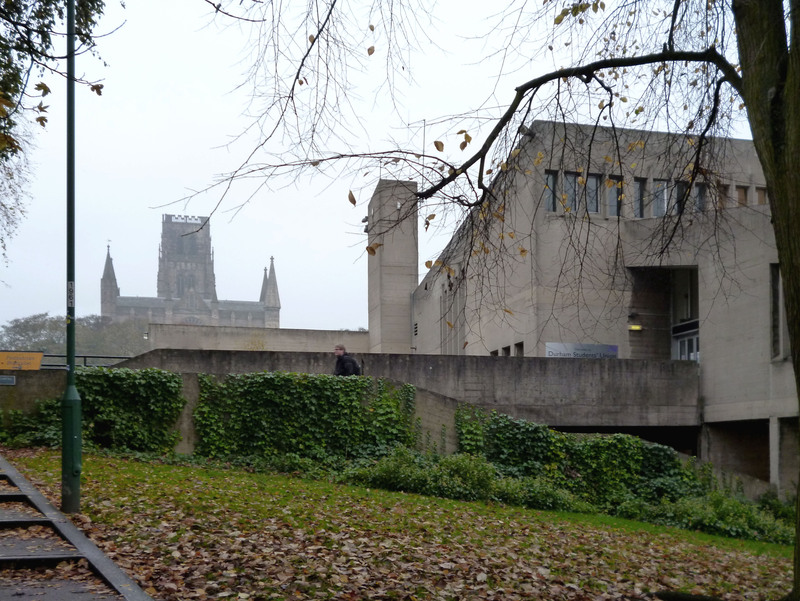 The simplicity and delicacy of the bridge design is seen next to a large but broken concrete ‘jumble’ sitting on a steep slope almost opposite Durham Cathedral. I have been a great admirer of this contrasting ‘duo’ from the day I saw these in mid 60s and my recent second visit has not disappointed me in any way. 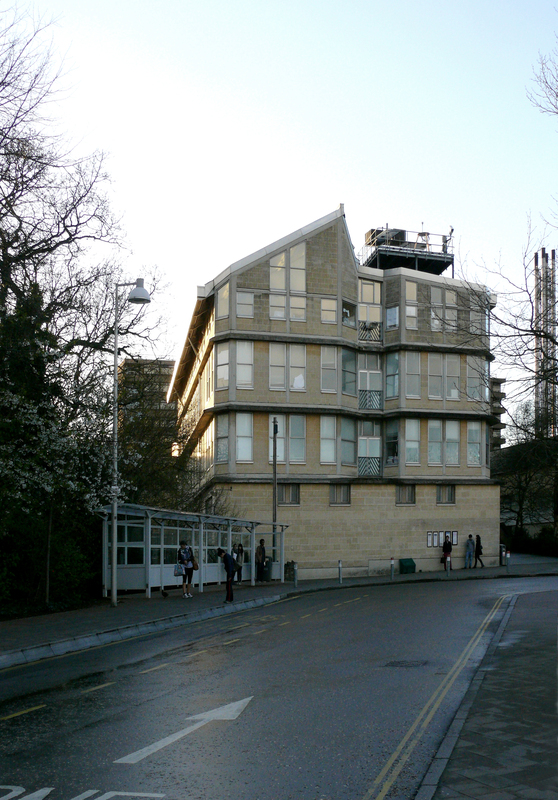 The bridge links Dunelm House to other university buildings across the river, while serving various buildings spread around it all over the city. 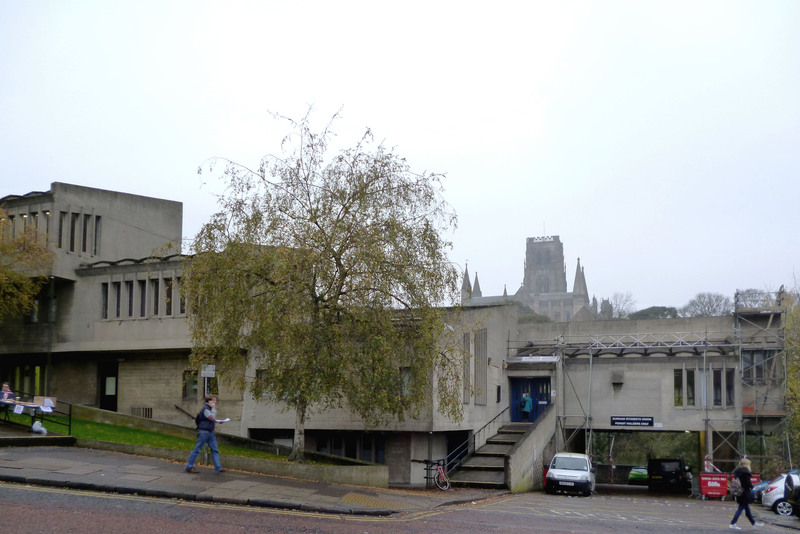 The design exploited the sloping site to its advantage by hiding a large building complex with some large volumes without breaking the existing medieval texture of Durham. The views from communal and other windows looking over the river and indeed the bridge offer superb views. The reflections of lights and life within the building seen from the opposite bank are also quite exciting. The building plan is conceived by forming a spine of stair route which collects the visitors at two upper most levels and starts their downward journey on this spine. All major usable spaces are at various landings along the route. The stair widths and landings reflect the significance of destinations. The stair stops at the lowest level which also houses the largest and less frequently used main gathering space. The original finishes inside the building were restrained and sombre. The grey concrete and quarry tiled floors were used in most places. 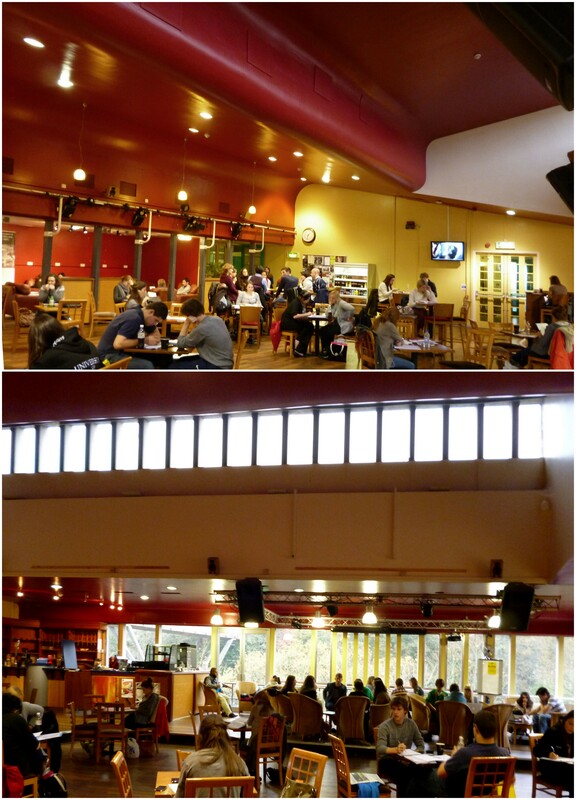 The current taste and more affluent student population seeks more Pub/Club like atmosphere. I am certain that such demands have resulted in use of some bright colours in main stair areas, destroying the unifying and linking function to move between various destinations. The yellowish tinge you see on my photos is result of paint and not the tungsten light or underexposure. The original white open ceiling white planks with dark sound absorbent filling behind has now become shiny red which one is happy to accept as transient response to cater the tastes of given periods. The external walls are made of lightweight (foamed slag) concrete fairfaced board marked finish both inside and outside of insulated load bearing external walls. It is remarkable to notice that concrete on Arup’s bridge has suffered heavy staining while Dunelm House is quite free from serious staining. This may be due to some property of the slag and its mix. 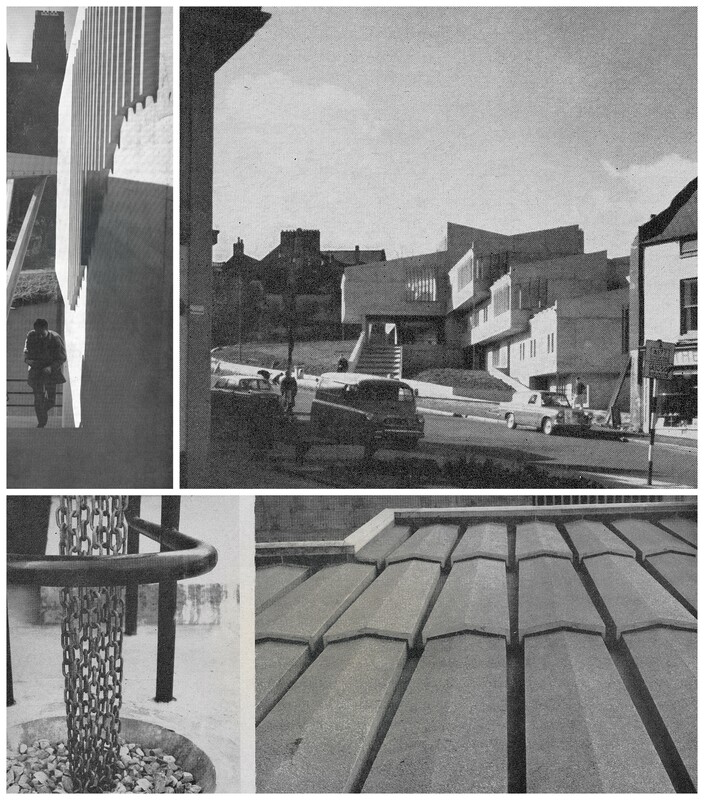 The original roof was meant to be covered in Zinc for economy reason, but Royal Fine Art Commission objected and the resulting precast giant concrete tiles were used using a pink shap granite. This was obviously a step to ensure that the visible roof was part of this cohesive massing and fitted in the townscape more successfully. The main entrances at the highest point of site at the junction of footpath leading to Arup’s bridge is brilliant design. 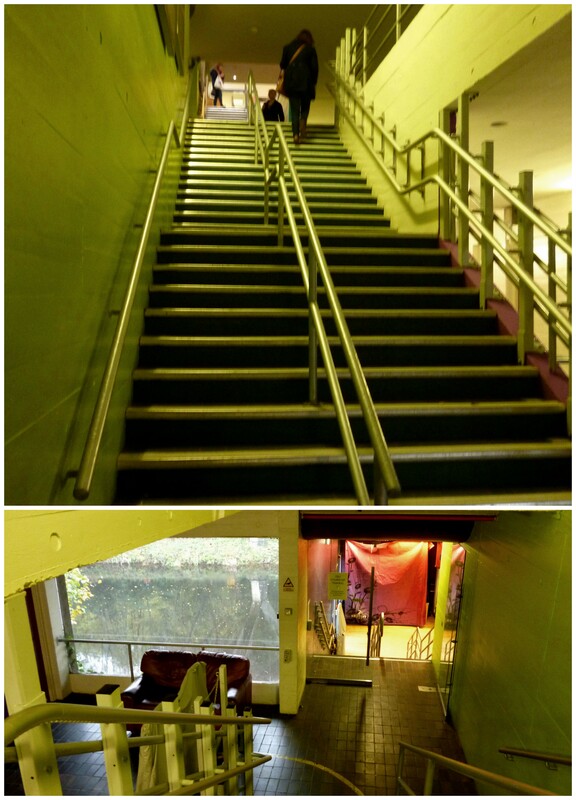 These entrances bring the users to the head of stairs, feeding them down like a constant ‘waterfall’. Black & White photos from AJ 15 June 1966 and two other B&W photos and Blue Cross Section from Architectural Review (date not visible) from John Donat’s article. This science based university wanted to continue supporting music drama and arts activities which took place in an old undersized barn and its outbuilding. Smithsons by this time had some experience of drip-drip of funding and their proposals for a new building incorporating some existing buildings went for a very flexible approach with no less than 14 components building offering maximum flexibility for growth as funds became available. 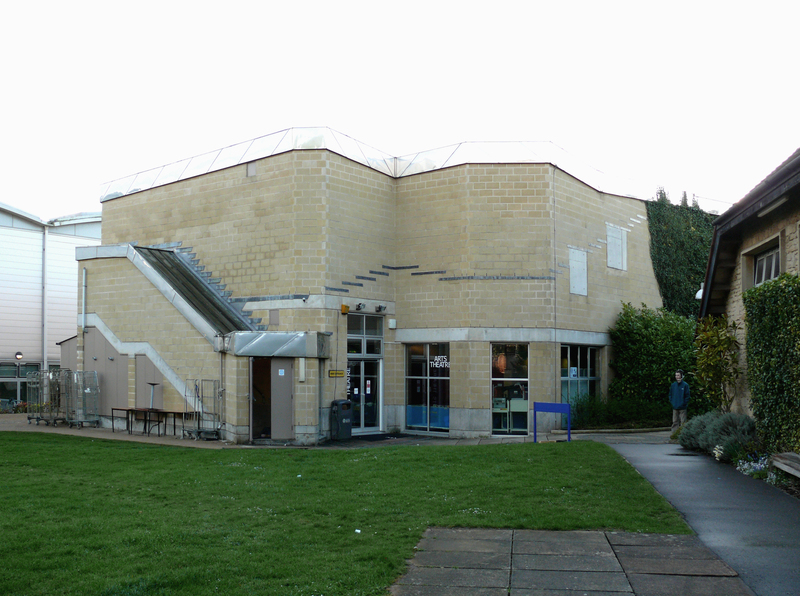 Unfortunately, the simple fact that funds quite often do not materialize for ages and the needs of the buildings change greatly meant that not one of these options was built apart from the first phase of this recreational building, a small performance auditorium at the east end of the campus was handed over to the university in 1990. One part of the original Arts Barn and Smithsons multi-functional performance space continue to function despite very limited ancillary spaces essential to manage a multi-purpose space. 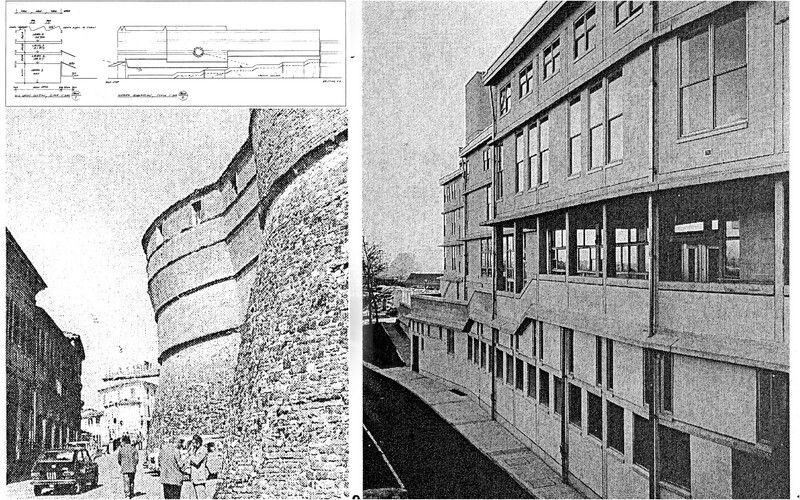 Some of the original windows had to be blocked to create these essential areas to the detriment of the building and its use. 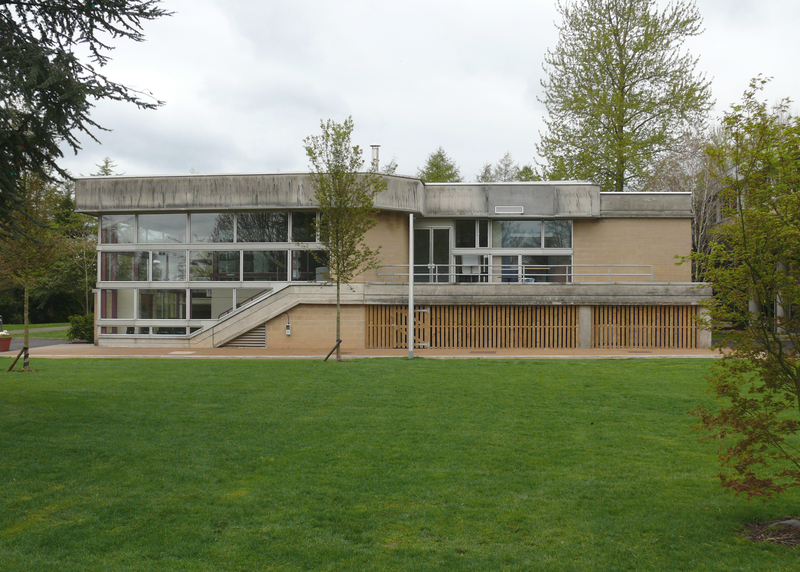 There have been two unsuccessful architectural competitions, and one more is in offing, to enlarge and create an appropriate arts centre for this well used and flourishing art recreational building. I must admit my own ignorance of influences of Hugo Haring on Smithsons till very recently, but this has been a key to understand a lot of things which begin to fall in right places. The development of a multi-functional performance spaces in Britain over last 50 years has produced some outstanding examples (Young Vic, Half Moon Theatre etc) but Alison Smithson’s structural mastery with a pristine timeless form, shunning all form making traps is a lesson I found a revelation. 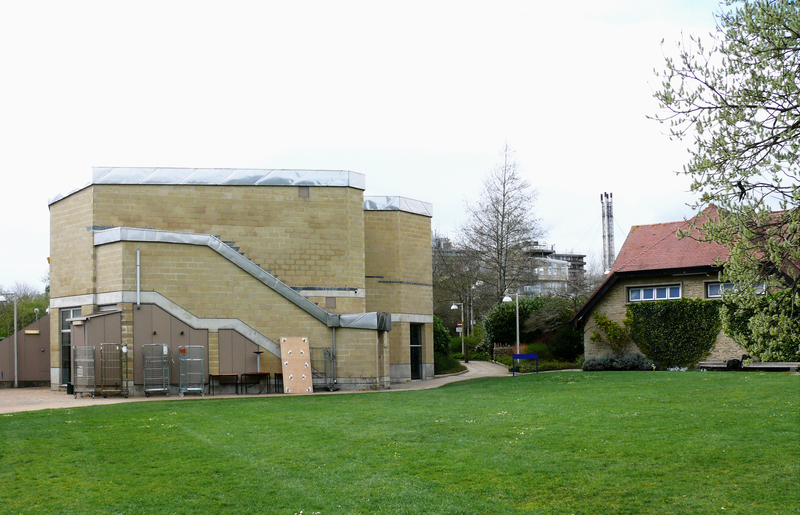 The location of old Barn and the new auditorium was used by Smithsons to full advantage by forming an edge to a forecourt situated to the east of E6 acting as satellite or a gate house. One must not be mislead by the simplicity of this building of sound construction using durable materials in a rectangular form. The simplicity of wall surfaces, both external and internal has been achieved by considerable hard work by architects and the structural engineers. 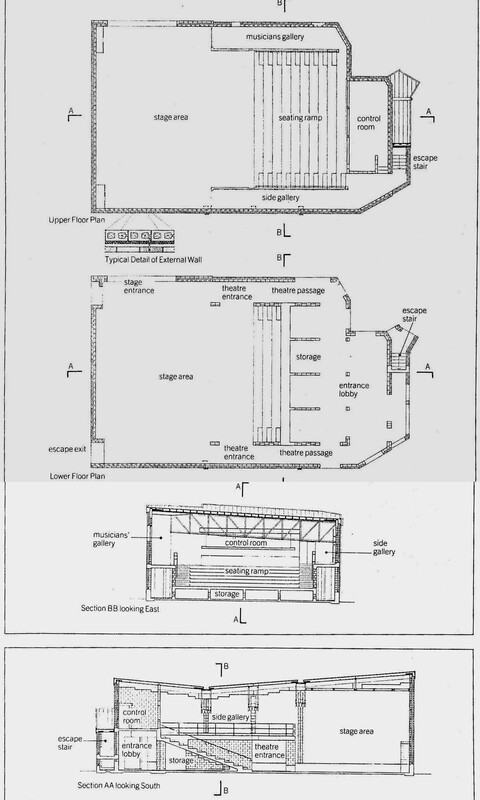 The load-bearing external cavity wall construction supporting an irregular plan form with twin gantries falling in one direction giving an asymmetrical section, relies heavily on lateral support offered by deep steel trusses, gantries and side galleries. A rather complicated system of vertical steel reinforcement rods in hollow concrete blocks filled with concrete at every fourth course and horizontal mesh steel in the coursing, in the areas where the supports were not available. This seems to be in keeping with Smithsons constant experimenting with the building process resulting in thoroughly ‘conglomerate structure’ and alludes to Hugo Haring school of thought. Another old theme of half complete building compared with a kind of ‘ruin in advance’ was also mentioned by Smithsons “ …a place that can be walked through like a ruined abbey … like San Galgano, to name one sufficiently modest … columns standing bare; inside, outside, both seemingly pastoral and as one”. Unfortunately stainless steel has never made a good ruin, but good construction and a sensible location would at least ensure (I hope) that the building is incorporated in a future larger project. 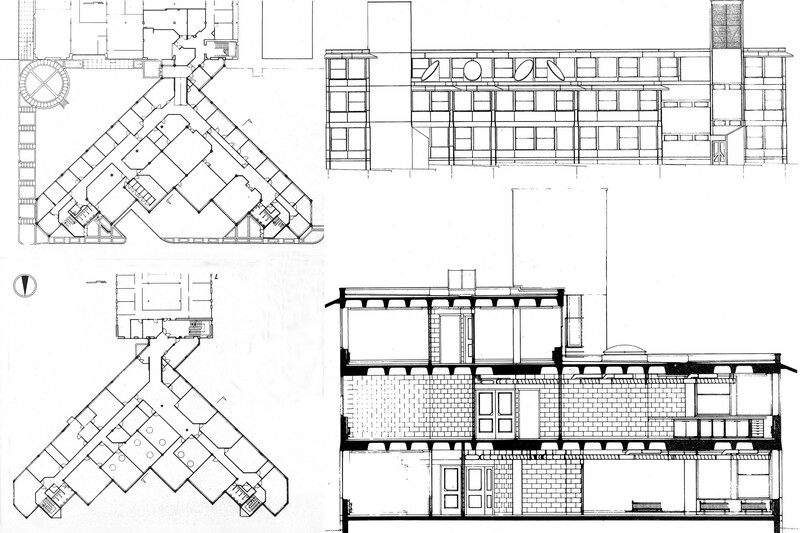 In a way I am relieved that Alison’s ‘Hexenhaus’ like spidery cellular structures were never constructed as their scale, location and design seemed completely out of character with the ‘mat’ of original campus. These intrusions were very likely to be in the way of recently built huge expansion to sports facilities next to the Arts Barn and were very likely to face a ‘Robinhood’ like fate. It takes a while for eyes to get used to severe reductive simplicity of visual language used in this structure, made more difficult by introduction of stainless steel fascias which stubbornly retain their hostile shine. The unexplained mysterious openings and ‘flashings’ still await any one of the 14 possible attachment of components which Alison Smithson designed in hope of future growth when the funds became available. The damage to a very tenderly and carefully designed building is difficult to assess when most of the major openings to the entrance lobby are blocked and storage facilities now clutter this (and external) space obliterating the vital source of light and views to the outside green space. I am afraid that intrinsic qualities of this small but important building and its link with the historic continuity to the modern movement have failed to register with the lay public and architectural world in this country so far. I feel that the only chance of its survival in a meaningful way lies with an intelligent architect appointed to extend this facility. This well built, carefully positioned building can easily become an integral part of the proposals as originally envisaged by Alison Smithson. A good case can be made on economical grounds alone but please do not forget, the duty of teaching the architectural students being trained within yards of this ‘architectural history lesson’ would sooner or later come to realize the intentions of these great teachers and learn by experiencing and moving around this modest, subtle and a great little building. The old b&w photos and information from AJs, 30 November 1983 and 16 January 1991. To understand the most significant building by Smithsons on the campus, the school of Architecture and Building Engineering or E6, one must try to comprehend the ideas behind ‘Conglomerate ordering’ which emerged in Sienna period of ILAUD.http://en.wikipedia.org/wiki/Ilaud This building demonstrates many of these ideas and twenty years of use have also thrown some light on Smithsons hopes and expectations. 1CO. * ‘ A building of conglomerate ordering is hard to retain in mind… it is elusive except when one is actually there; then it is perfectly lucid. 2CO. ‘It brings all our senses into play through the widest possible differences: fear and pleasure mixed together. 3CO. ‘The building has a thick building-mass; (as La Granccia di Cuna and Santa Maria della Scala) not very high…penetrated from the top for light and air. 4CO. ‘The roof of a building is another face …all faces are of equal value, all equally considered, but non are “elevations”. 5CO. Conglomerate buildings are an inextricable part of larger fabric .It has no back, no front; it is equally engaged with all it confronts. A change within its “convention of use” enhances its sense of order. 6CO. Its fabric can accept interventions. 7CO. It is dominated by one material… the conglomerate’s matrix. 8CO. It seems to be pulled-down to meet the ground, not the ground built-up to meet the building. 9CO. It is lumpish in weight and has weight. 10CO. Its bearing walls and columns diminish in thickness as their load or need for mass diminishes; walls and column spacing is irregular, responding to use and natural placing. 11CO. It has a variable density plan and a variable density section. *The numerical referencing above does not represent any order of importance and simply being used to refer to my descriptions/observations regarding this building. 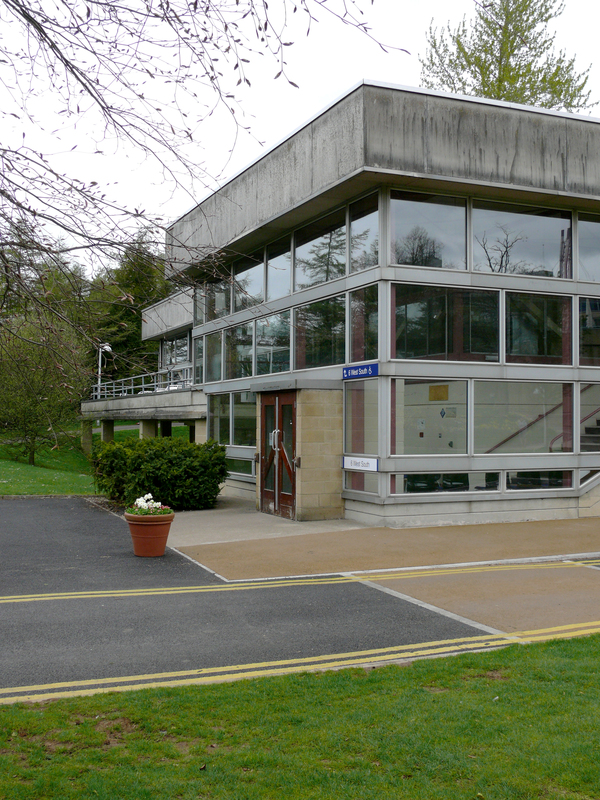 I consider the location and design of this entrance building as pivotal for the campus. Not only it was to act as a ‘sign post’ for entrance but it was to perform the task of moving thousand of students and staff from ground level to main raised deck and down again. 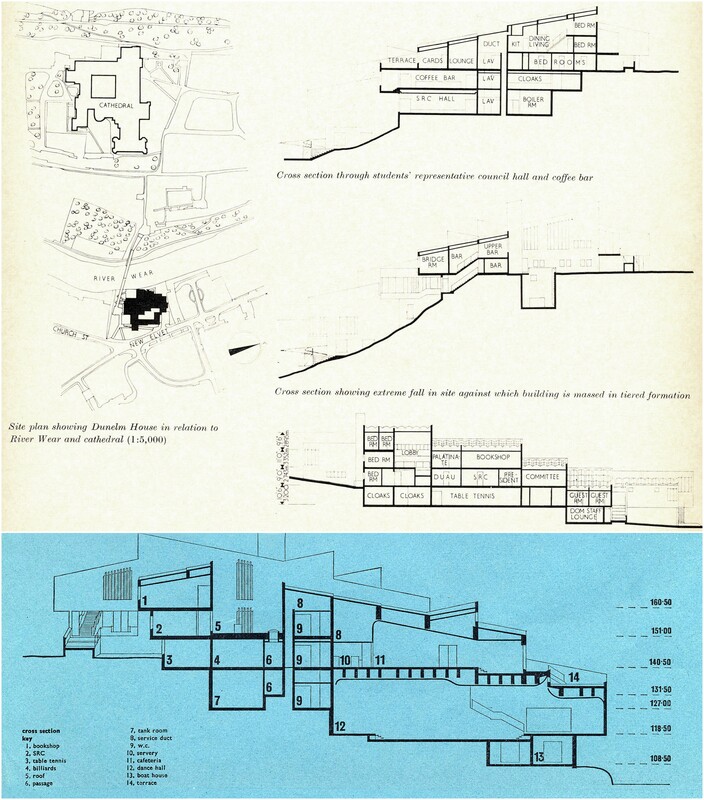 It was built well after completion of 60’s campus development, indeed almost at the end of the productive life of the architects, who were also going to show their final hand to test and explain ‘Conglomerate ordering’ among other thoughts. The best way to share my views of this long awaited visit is to understand and explain architects intentions and then try to share the buildings in their present context. The wear and tear caused by the general use and age and any changes due to change of functions can then be highlighted. I am afraid some effort is required on our part to understand the architectural process used by Smithsons which produced a small body of disparate work of undisputed architectural significance. 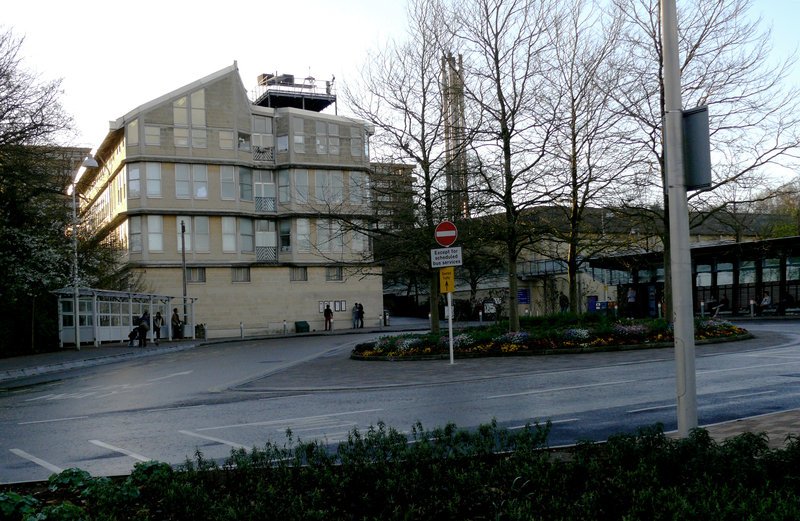 Let us start by describing the impact of arriving at the campus for a first time visitor who has just parked the car in nearby visitors’ car park. The positioning of a large bus stop/vehicle turning place with bus shelters around it and pedestrian friendly surfaces, surrounding landscaping and buildings announce that this is more than a bus stop and makes you register it almost like a town square. This feeling of arrival is reinforced by the presence of a slightly odd end of a longish slab building which is welded to this ‘arrival space’ near one edge at a slight angle as though it is trying to envelope the ‘space’ just described. Since you have no clue as how to enter this huge complex of buildings, your eyes run past the end of the ‘odd’ building and there is no doubt in your mind that a major route is being announced by presence of very wide steps attached to this building looking straight at you. This invitation (with an Italian accent) is irresistible and without any hesitation you undertake this journey of discovery. 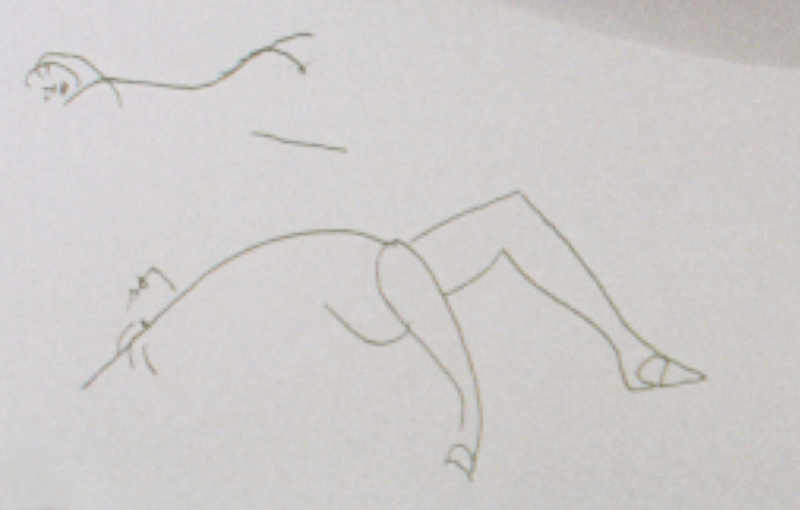 Oscar Niemeyer’s sketch from his 2003 Serpentine Gallery Pavilion is for me the best analogy I can offer (with the sincerest apologies to Smithsons but possibly delight of Neiymer). Can you imagine asking some student at the bus stop for directions to get to Architects Department and getting a reply “Go up to the knee and turn left, but don’t take the lower path” or “Library? ah! go right up to the belly button and turn right”. The wide steps are arranged some distance apart at different angles hugging the side of the long building. You notice the steps reduce in width as you climb and you also gradually find yourself under the cover of upper construction of this building. You are also aware of obstacles like balustrades and local ramps near doors trying to impede your upward journey. 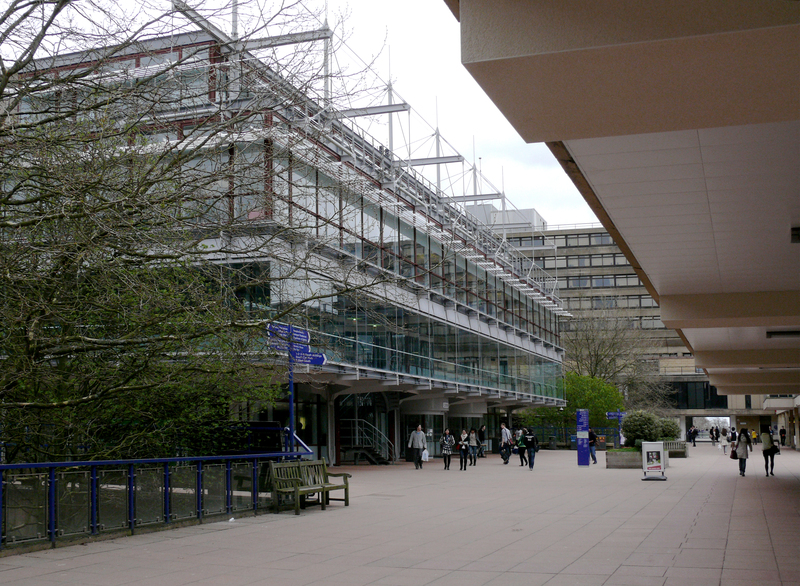 If you happen to look into the building through the windows on left, you are bound to notice large display of architectural photographs fixed to a corridor wall running parallel to the route you are following. 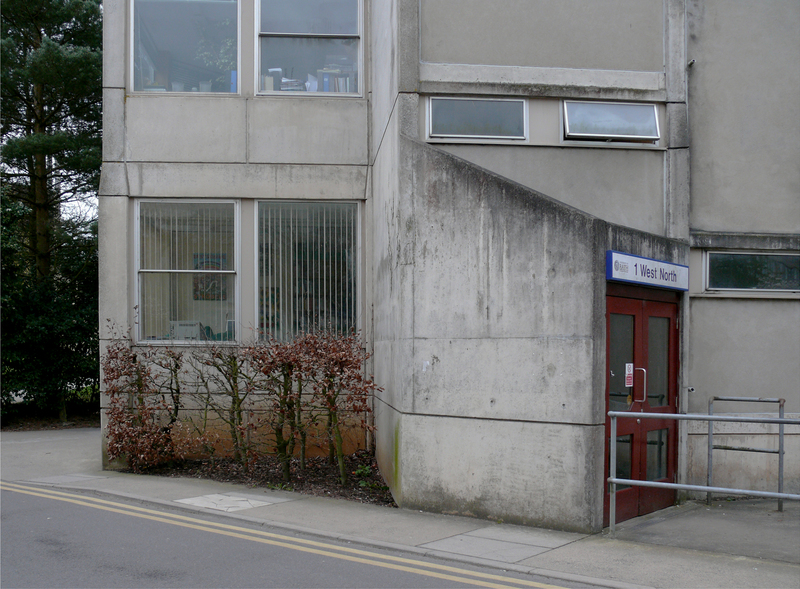 Some entrance doors to this corridor and signs indicate that these doors take you to the School of Architecture. If you look to your right and backwards you would have gained enough height to see distant campus building and the country side. After a fairly long walk but gentle ascent, these steps bring you to a very large platform on the right. This space has trees and is surrounded by lots of high building on each side and bridging overhead. The ‘odd’ concrete building with attached steps which offered cover to this route has now attached itself to one of the older arcaded buildings around this raised area, and you are still walking in an older arcade. (The width of Smithson steps was predetermined by an existing arcade of the same width to which these originally connected to, well before the upper deck was reached. This in not the case any more, as the deck has been extended towards E6 to meet it and a new lift has been located here basically to for disabled users. This act of arrival via steps of fairly restricted width to a very wide platform originally was a puzzle to me as there was no apparent reason for not finding a more generous stepped ramped approach. Another set of stairs has been added to the other side of the road as well (second of Oscar Niemeyer’s sketch legs). Having reached your destination, like any sensible architect, you retrace you steps and experience the journey backwards and explore the other side of this ‘oddity’ of a building. This is an entirely different world. A great deal of raw building materials and machinery paraphernalia dominates the back yard; you obviously are in the Building Engineering department of the campus. This area has its own vehicular access and much more formalized disposition of windows responding to other surrounding buildings. There is also a bit of playing with forms (God forbid!) 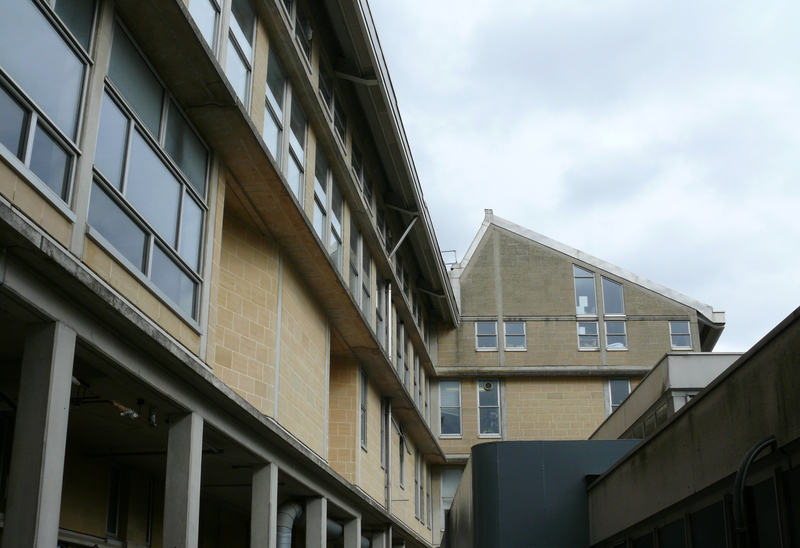 as the back of lecture theatre shows its presence by two chamfered walls expressed on external elevation. 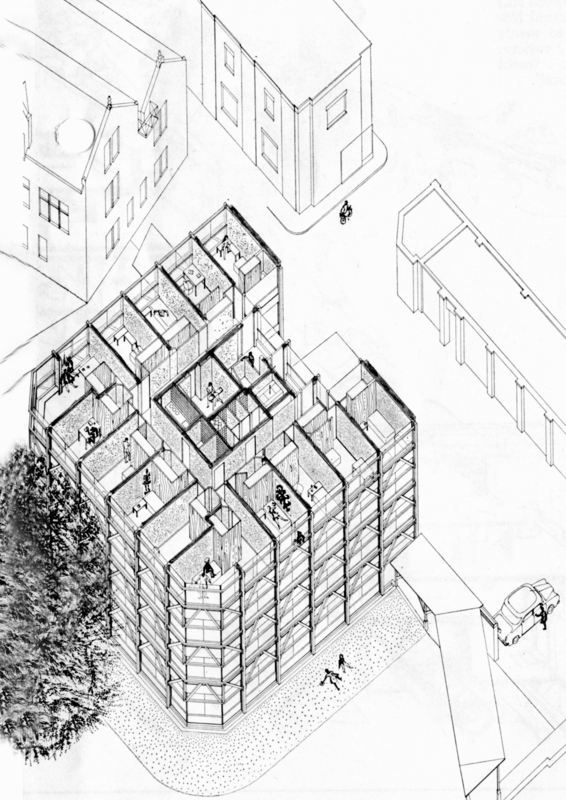 When you see the end of the building facing the ‘square’ carefully, it becomes apparent that this also acts as a cross section explaining the assembly of the constituent parts (corridors, roof lights, Workshops supporting studios, roof platform for daylight studies for school of architecture). There are two doors linking School of Architecture to the grand staircase at slightly different levels and in turn connected with another local circulation passage running parallel to the main stepped route offering views in and out and also offering on display some architectural activities and serving a generous crit room also acting as a lecture space. 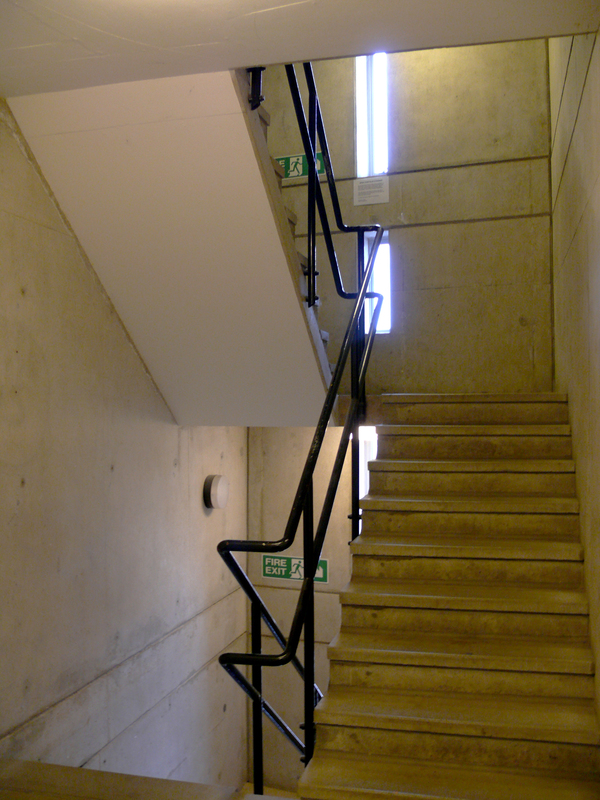 Two stairs and a lift also connects the entrance level to serve most of studios, seminar and workrooms on two floors above and access to the ground level below. A walk in the school of architecture soon reveals that there is a great shortage of social and informal meeting spaces throughout the building. The circulation spaces are too restricted to offer any other meaningful activity. I assume it is a direct result of financial straitjacket architects found themselves in dealing all the work on this campus. A quick look at the list of ‘conglomerate ordering’ (with numerical references above) reveals that Smithsons have managed to achieve most of their aims. 1CO- I can verify that building is hard to retain in mind as despite my best efforts to recall what I saw internally, I was unable to draw a plan with any certainty. 2CO- matter of all senses I am afraid is difficult to comment on. Fear and pleasure are strong words. The daylight quality in studios and views are pleasurable and nice. 3CO- Building has thick mass and lit from the top indeed. 4CO- All faces, including the roof are well considered and are of equal value. 5CO- The building equally engaged with all it confronts. Some major changes within the building have already successfully taken place without any change to sense of order. 6CO- Fabric is continuing to receive interventions and thriving. For examples most of the studios are new interconnected with new openings and various walls have been added or altered. 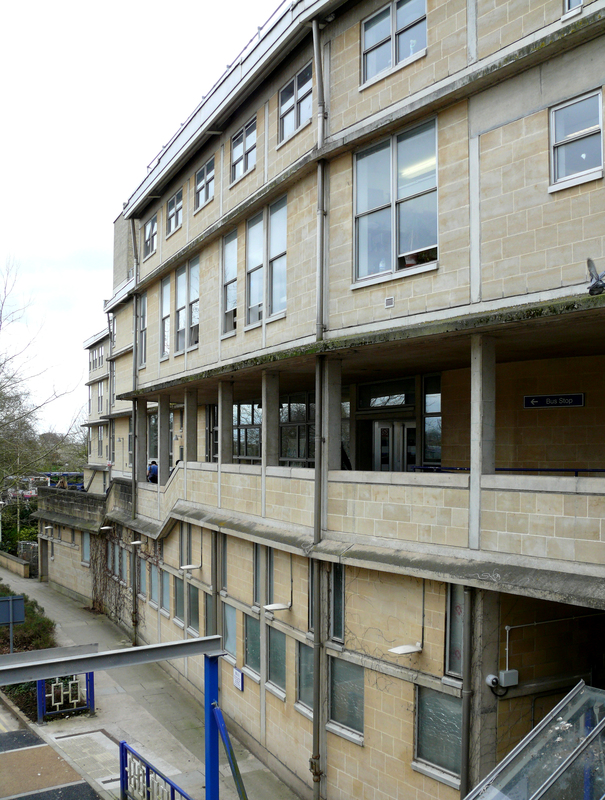 7CO- The use of Bath stone and concrete frame remains the conglomerate’s matrix and weathering well. Horizontal banding of concrete is even more pronounced because of lichen growth on it. 8CO-The grand staircase literally pulls the building to ground. The walk on grand staircase offers interesting little incidents but does not make any attempts to perform visual gymnastics which have become the hallmark of new generation of architects. The real contribution lies in linking one newly created space to an existing one, without trying to dominate any but keeping the interests alive throughout this transition of height. 9CO-Building is lumpish and has weight. 10CO-Walls and columns respond to load and reduce where possible. Columns are irregularly placed for many areas responding to use. 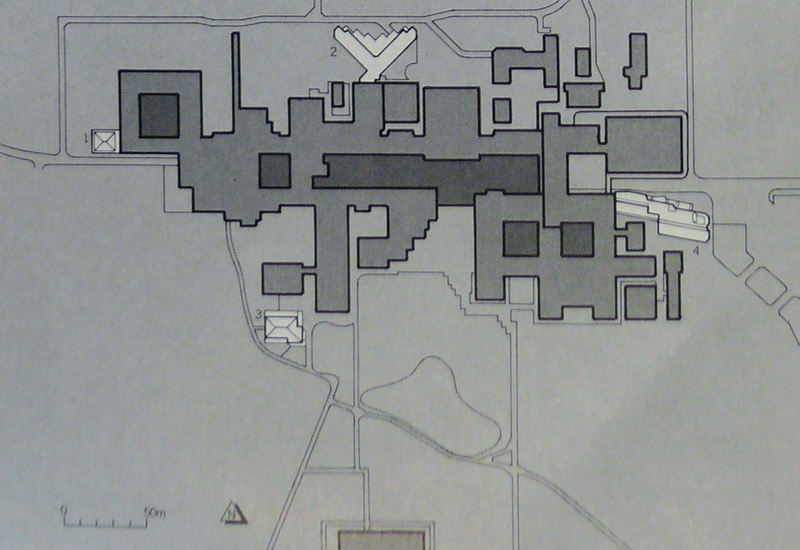 11CO- It has a variable density plan and section. When the building opened all of the School of Architecture could not be accommodated here but now it is all under this stainless steel roof and looks very happily settled as one can gather from the usual assuring clutter of models drawings and odd furniture in well lived in studios. The exposed services originally were considered crude but constant changes have proved that this was the right decision. The building must have absorbed many changes to services particularly in relation to new IT changing needs. 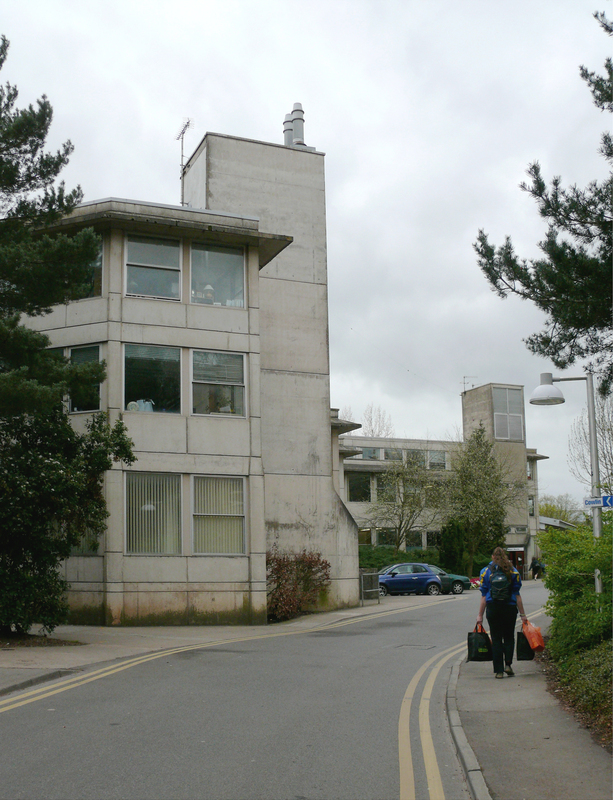 It appears that the results are more than satisfactory and continue the original relaxed looking distribution without any known failure of crops of young architects coming out of this school with phobias about exposed services. I have no doubt that this building would remain a fitting tribute to the architects who chose to close their architectural account with this. It may take some time but I am sure it will mature like a good wine. All old B&W photos, plans and various absracts taken from AJ of 30November1988. Smithsons have earned themselves a very special place in 20th century British architectural world to sit on a high ledge and look back at their lifelong work consisting of some seminal buildings, influential and extensive writings and indeed some heartbreaking disappointments which almost drove them to despair. 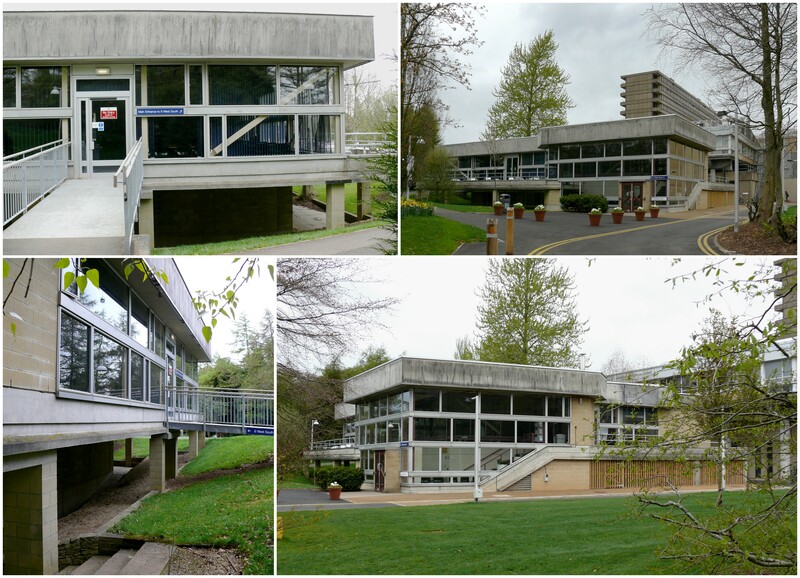 Their final projects were built at Bath University campus which was founded in 1965 as a college of Advanced Technology based on a master plan by RMJM. 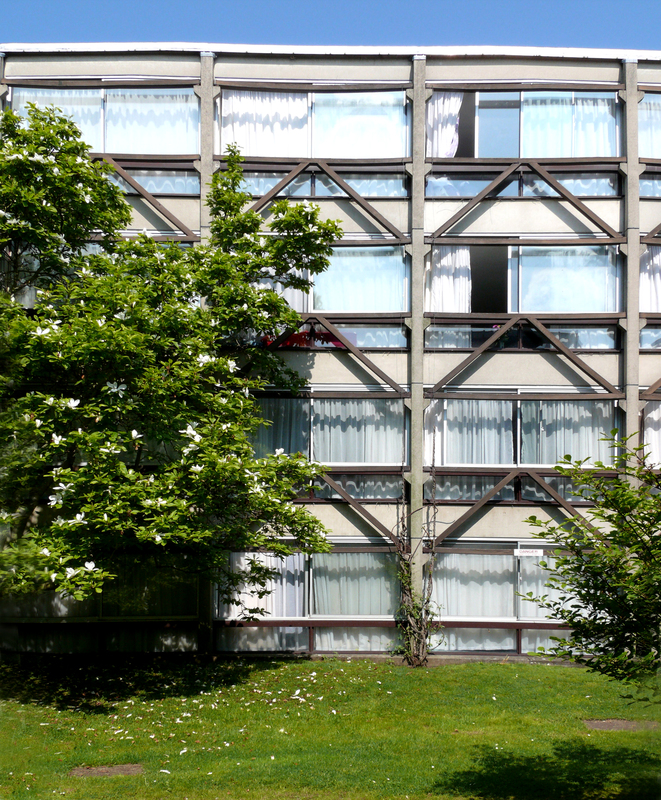 I recently visited the campus for the first time to see Smithsons projects which are not very well known here as these were designed by them towards the end of their lives after a long and painful ‘drought’ of work. The architectural landscape of early 80s in Britain had changed and was dominated by new ‘superstars’ producing visually exciting stuff. The younger generation being taught by Smithsons failed to notice the pedigree and place of their new work in recent historical context being built around them. In fact, by this time most of the architectural world was not interested or impressed by what little they noticed in the press. Smithsons as usual were not to be swayed by the current fashions and in their normal defiant manner they took up the challenge to put their architectural legacy in rightful historical context with this last chapter they wrote and edited themselves. 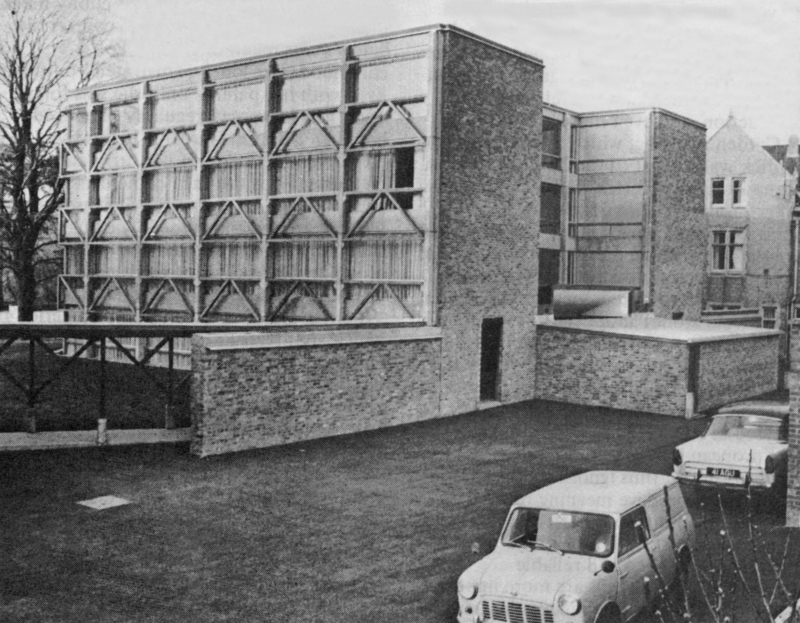 The second Arts Building was described by the architects as a new piece woven onto the edge of an existing mat… like a terminating fringe …seemingly complete. It is three storeys high and delta shaped in plan. A ‘knuckle’ lobby links this building to the older building next to a staircase. Three different departments were housed on different levels and the room functions were allocated according to type of occupancy, need of looking out, need for darkness and thermal requirements. A Zumthor like feature has emerged where Smithsons wanted ‘internal ways’, (corridors to you and me) to have an exposed blockwork finish which had a carefully calculated acoustic quality – ‘the noise of one’s feet getting quieter as one penetrated the building’. This plan was foiled as the university proceeded to plaster these surfaces, which architects described as an occupational hazard. 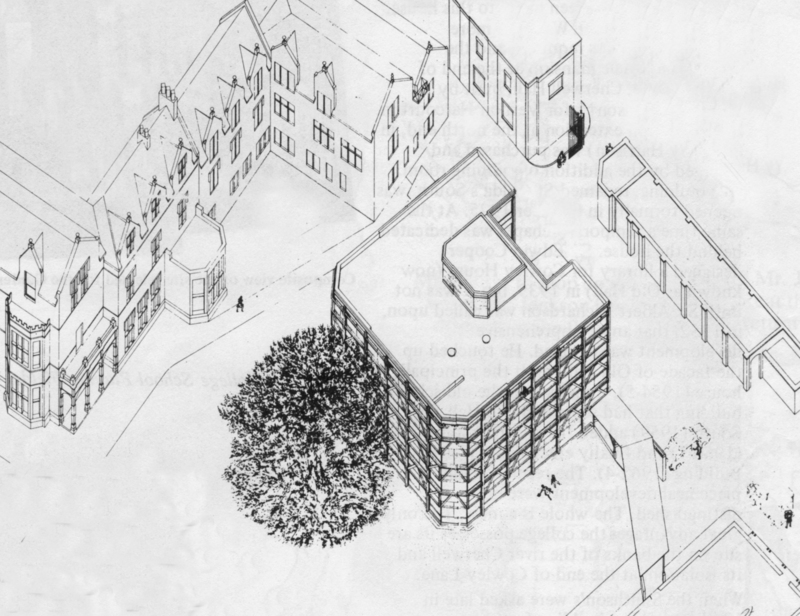 The plan is attempting to create triangular landscaped courtyards which Smithsons were hoping to be full of mature landscaping after 20 years or so. Smithsons used a similar analogy by calling the timber trelliced work at St Hilda as a kind of ‘yashmack’ offering some protection to the female occupiers of the bedrooms. While the outer edges of tassels forming the triangular courtyards are straight with ribbon windows and v-joints in concrete surfaces (Smithsons first venture in exposed poured concrete) leading to a language of external surface grooves, the north facing face in between these edges has a zig-zag edge which is firmly held between two stairwell towers rising high to contain air-handling plants at either end. This orientation of the building is also an attempt to make the back of building look more animated and less of a ‘back’ of ‘centrally focused mat’. ziggurats to achieve the architectural shift they sought. I was not able to go in Arts building, or talk to any occupier and therefore am unable to comment about the functional aspects. Unfortunately, the overall appearance of the building, massing and now fairly matured landscaping are not offensive in any way still leaves the architectural anticipations and emotions ‘thirsty’ from such great names. 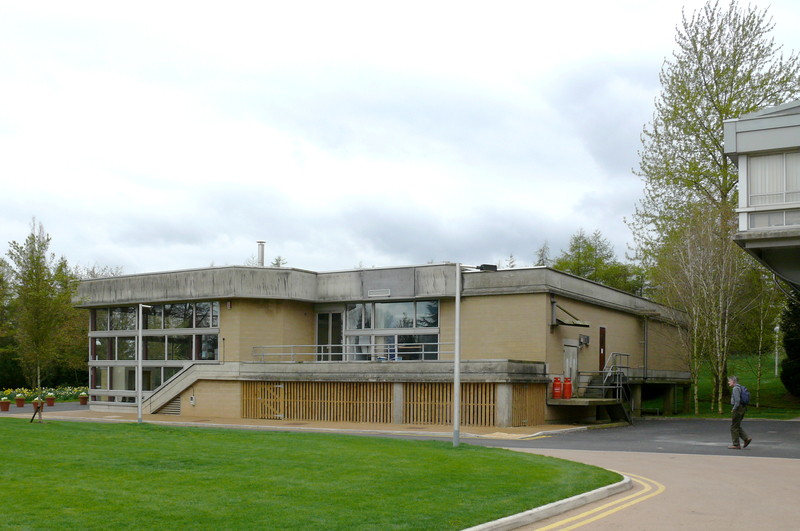 This building is located on the south side of the main campus in a two storey high detached pavilion. One can see similarities with their famous1960s Upper Lawn Pavilion at Fonthill. The upper floor here looks in three directions and sits on a partly submerged heavily constructed ground floor. I am unable to find out whether this base was some existing structure or created by Smithson themselves. There is a very definite back/service side to this construction but other three sides and indeed the roof have been designed to deter any future additions to the structure. It is meant to be a defined punctuation mark not there to be meddled with in future. 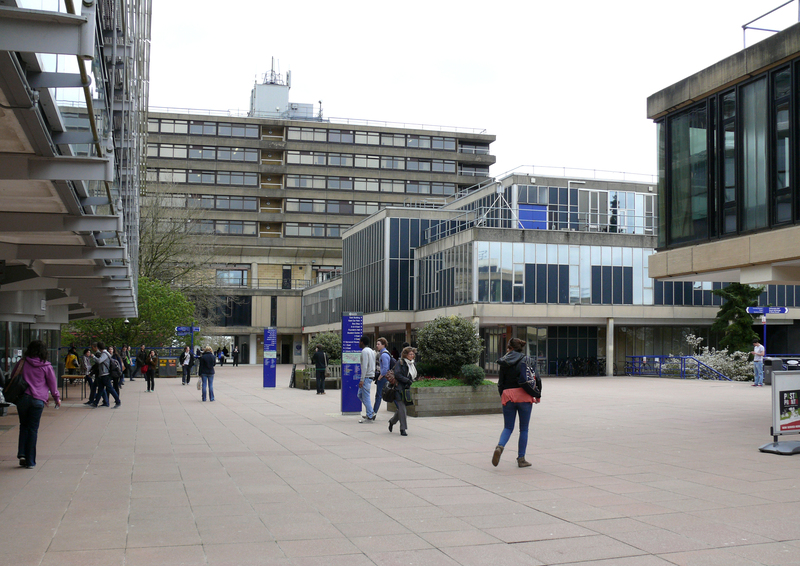 All this is perfectly understandable for a building to be seen and used by users approaching this key location from all parts of the campus also ensuring the edges of the ‘mat’ are suitably terminated. The light weight steel construction of upper floor relies on heavy cross bracings on corner and a substantially heavy concrete fascia beam has been attached to light weight steel sections for support. 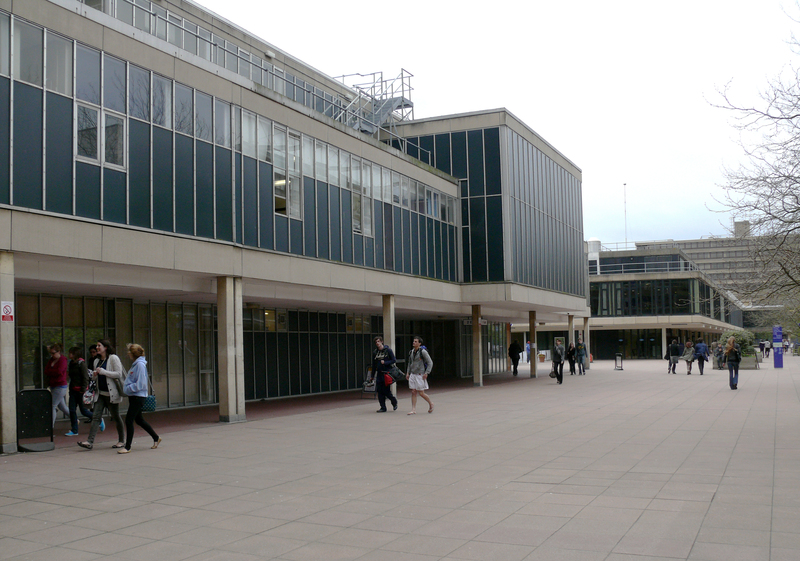 The recessed voids on semi-sunken lower level remain function-less and are still cause for concern to the university and were recently fenced off. 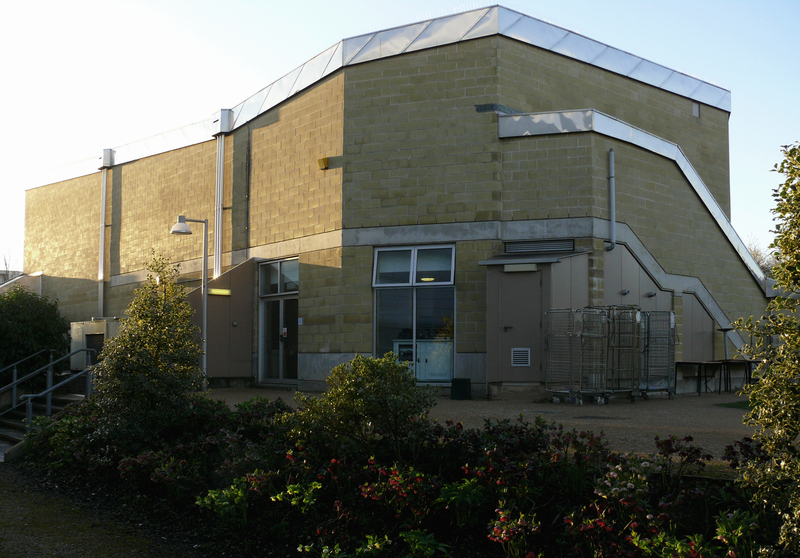 The concrete fascia may be attempting to relate to the existing vocabulary of older campus buildings but it is worth remembering that the Arts Barn on the other side of the campus has also got a steel roof and fascias both covered with stainless steel skins. However, the limited availability of funding an inherently expansive and space wasting semi-submerged resting base for a bridged access ‘piano-nobile’ and attached terraces may have produced an adequately functional building, but I am beginning to develop some inferiority complexes about my own ability to appreciate some hidden qualities of these two great architects who possibly are too cerebral for me to follow as I have to admit this building leaves me bereft of any architectural emotions resembling joy or pleasure. The following issues of AJ were used for References, plans, photos and quotations; AJ 30 November 1983. AJ 16 January 1991. 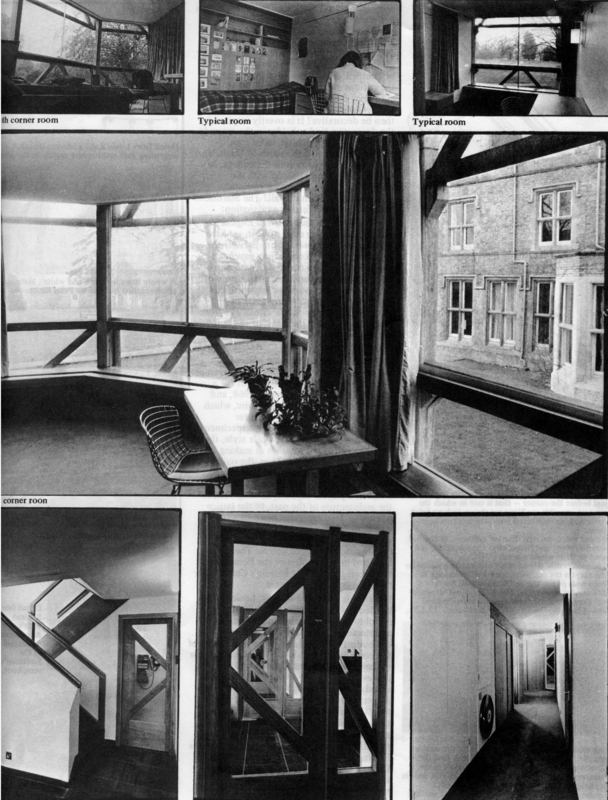 St Hilda’s Garden Building never failed to raise eyebrows from the day it was published and built. Smithsons reputation in this country meanwhile had its up and downs and is currently facing the final humiliation of the demolition of Robin Hood Garden housing in London. Stirling took delight in doing summersaults and gymnastics with his dazzling display of form making and bursts of creativity, when questioned, criticized and taunted his short and sweet answer was a sign of ‘two fingers’ and a ‘f*** off’. Stirling’s Florey building, built along the same river side is literally a few minutes walk from St Hilda and was built almost at the same time, but comparing these two buildings gives a fascinating insight into two very British creative mindsets, quirky yet brilliant. 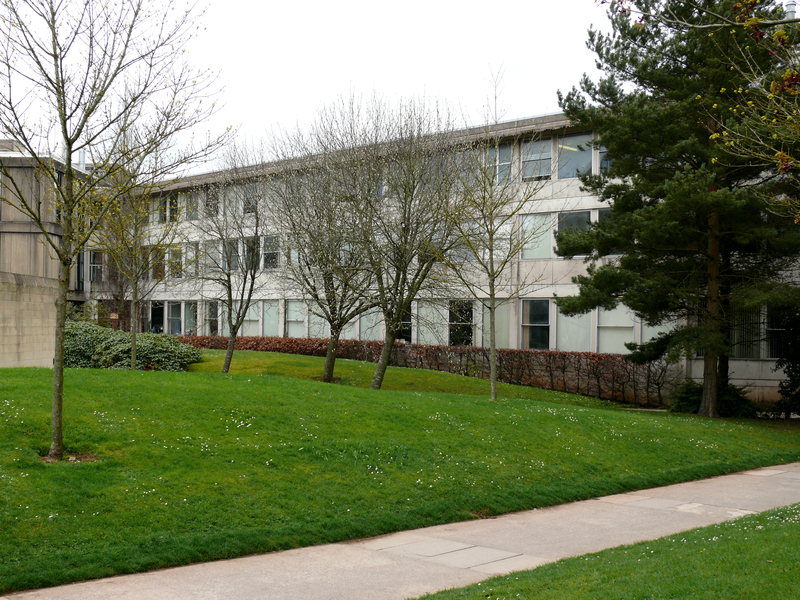 Smithsons could have chosen other locations for this building within the college site but dutifully decided not to close the view of the river for rest of the college at present or in future. 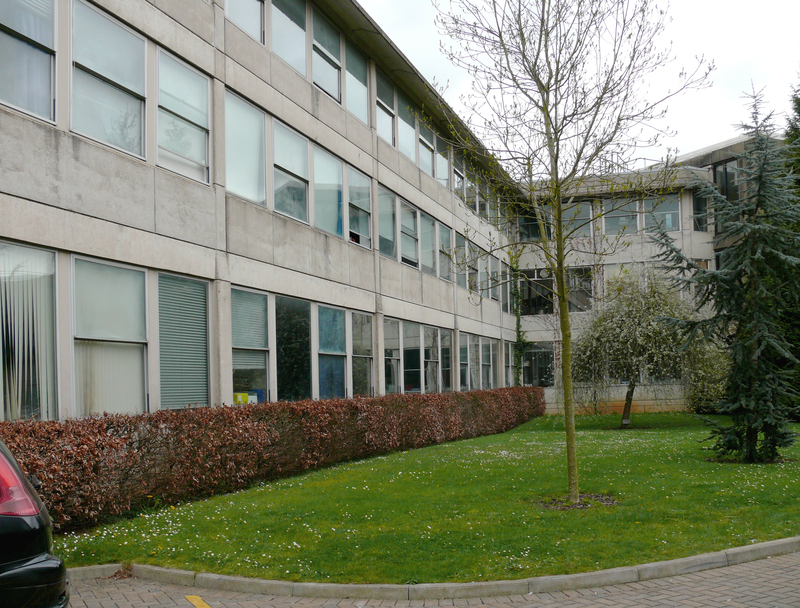 They also attempted to create a service road at the back of the building, which could be extended to resolve the vehicular service for the future college growth without impacting on the green space. 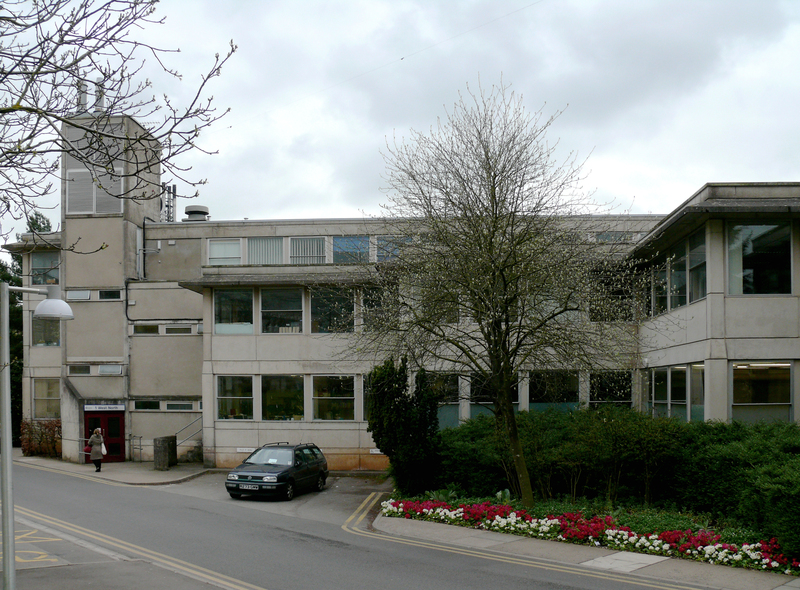 Their preferred site was the space between Cherwell Hall (Wikinson’s Gothic mansion, 1879) and Wolfson Building (Richardson 1964), with tentative physical connections to each, formed using brick walls, timber frame and roof forming walkways. This sets the stage for a perpetual dance between the single mature copper beech standing close to the new building with a stretched arm twirling the building, dressed in an attire of see-through dress, embroidered with the lacework of greenery. Smithsons quickly arrived at forms by re-using ideas from Economist design. 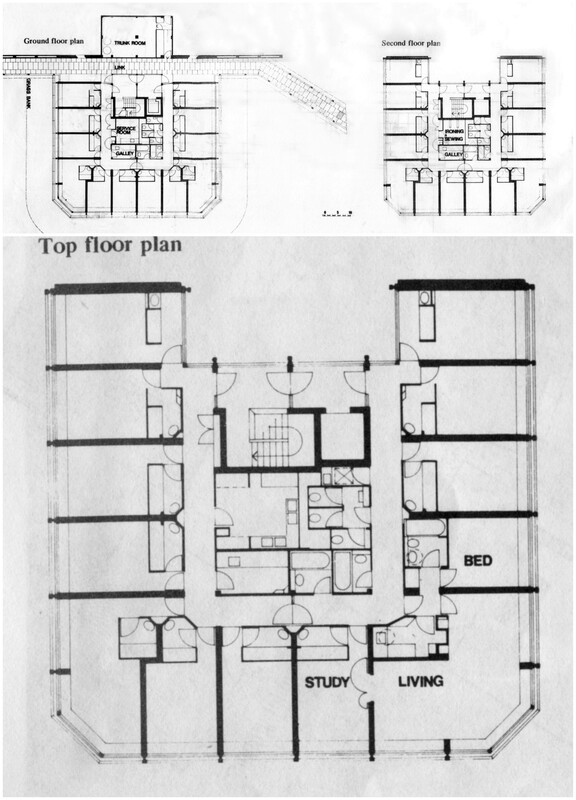 The floor plan was based on one of the towers. 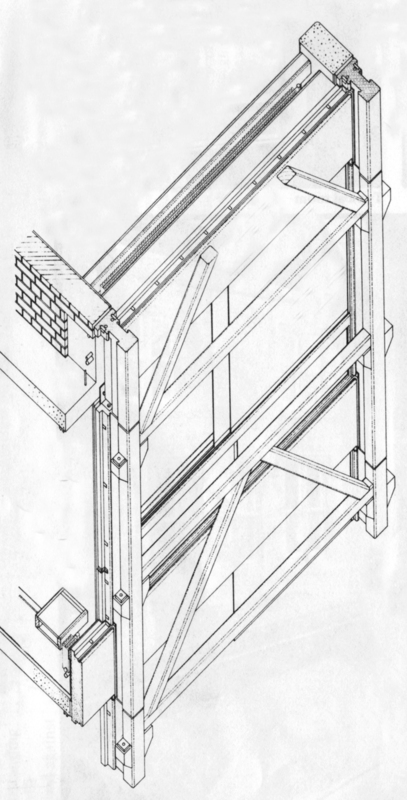 The concrete pre-cast posts, including the vertical recess/channel were also from Economist, which in modified form were also used in Robin Hood Lane as vertical sound baffle, although in both cases these were structurally not performing the implied load bearing/frame function. It seems that right from day one Smithsons’ empathies were with this cash strapped girls college trying to make inroads in this well established ‘old boys’ network’. 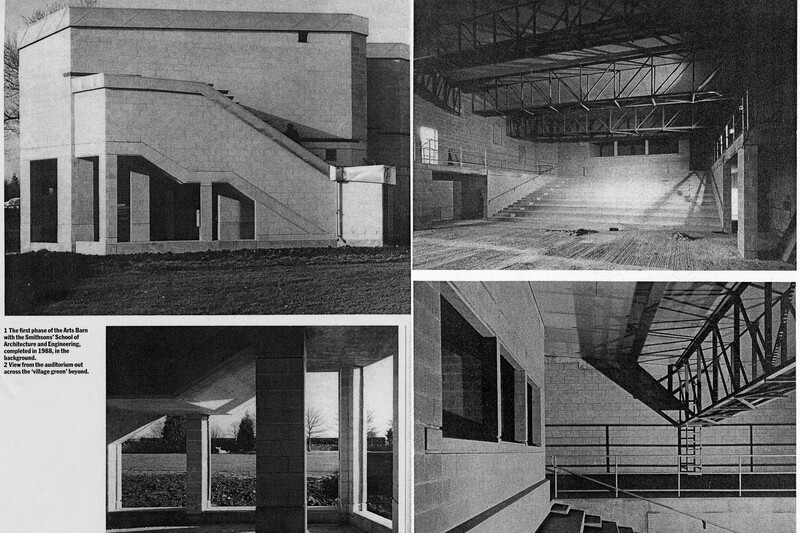 Anything remotely wasteful was to be shunned; answering the precise college requirements within the costs and design a building to bring a sense of coherence to the motley collection of college buildings was more important than adhering to any architectural philosophies, iconography or displays of egotism. This they achieved with great success but with a mischievous twist or two for their peers to resolve, who they fully expected will be watching and scratching their heads for some time to come. This is exactly what followed. The indeterminate quality of elevations, floating timber oak frame work resting on concrete knuckles, precast concrete mullions masquerading as load bearing frames in front of load bearing cellular brick walls separating bedrooms behind, may have teased us all but there is no denying that the completed building remains calm and unpretentious and well and truly wedded to the site. The building fulfilled the brief requirements of bed layouts, acoustical privacy, short corridors, wash basins in mini-dressing rooms and pedantic insistence on clothing storage for each unit, which all came within the allocated costs. The AD article calls it a ‘tudor yashmack’, a phrase difficult to improve on as at the time of designing St Hilda, holidays trips to Tunisia and fascination with Elizabethan black and white style is well recorded and Smithsons were fond and capable of playing architectural games. A small ‘quip’ has also come to my notice. The building was definitely designed to have a front (three sides with windows) and a back (with London stock bricks). Smithsons were keen to emphasize this and decided to drop a big box of a lean-to roofed ‘Trunk room’ exactly the same size as the opening between the two brick panels, under the glazed cut out square forming the entrance. The box structure looks like a lid which has been unhinged from the building to rest on the ground. This room blocks the entry by being bang in front of the main entrance, had a tenuous roof link, and defines the ritual of students arriving at the start of the term with trunks bursting at the seams and leaving empty suitcases in this shed to collect at the end of the year. 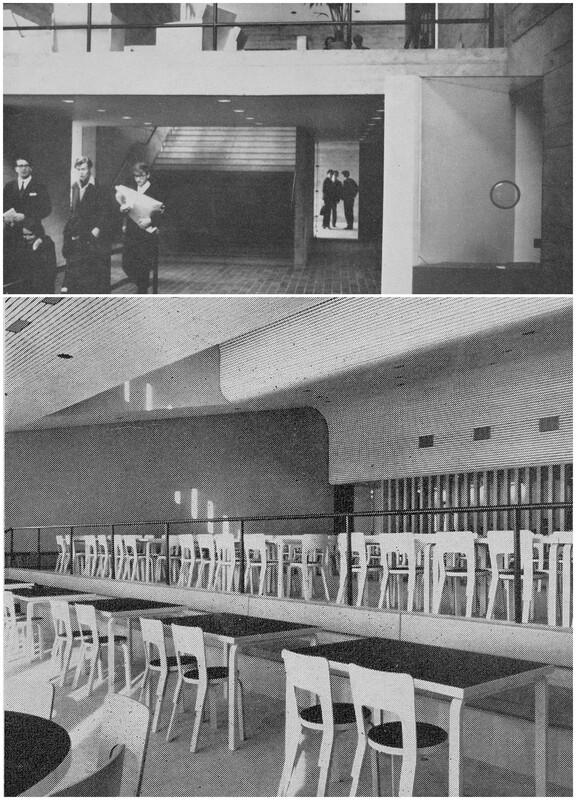 There are two openings, one on each side of this room (which is now demolished) allowing entrance to the pedestrians approaching from the service area at the back. These openings have chamfered brick edges directing people towards the centrally placed entrance, highlighting the ‘pincer-movement’ of entry to avoid the Trunk Room. A little joke which obviously was not noticed or appreciated by recent architects who have dropped a rather mundane looking canopy where the room used to be. For us to try to find the sources of inspiration, I feel, is a futile exercise for architects who have spent most of their life looking and studying a myriad of subjects in every corner of the world. However, I show the list of inspirations from the AD article more as a game. 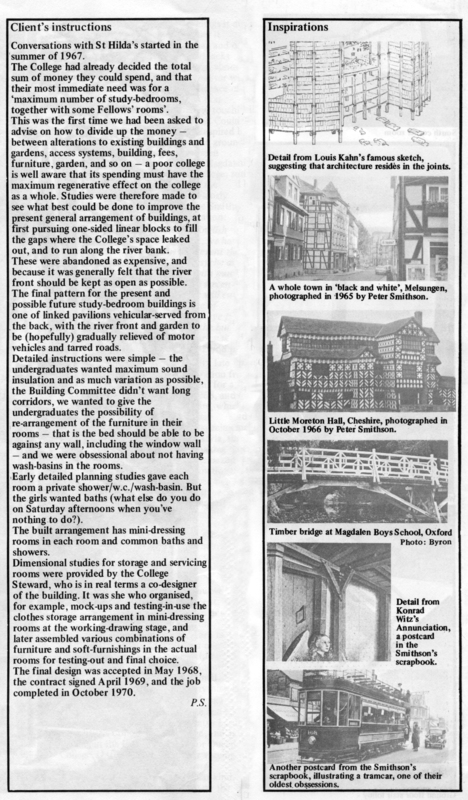 An article about this building in Architectural Design February 71 (photos and some information taken from this article) titled ‘The pursuit of ordinariness’ says that the building and room design is such that one is transported to the world of Peter Rabbit, Jemima Puddleduck and Mrs. Twiggy-winkle of which Alison Smithson has written so nostalgically. 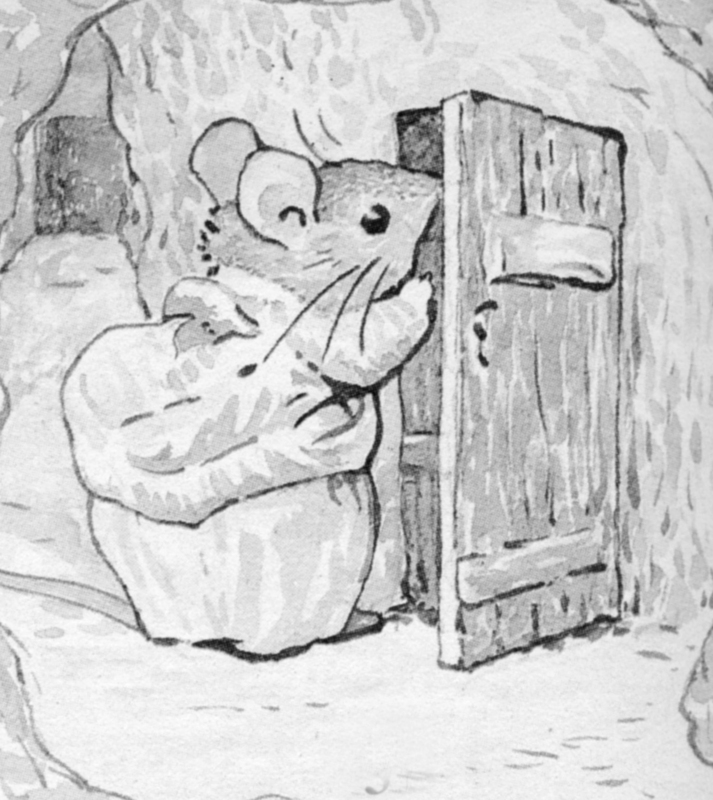 In Beatrix Potter’s interiors, she wrote in December 1967; “Objects and utensils in daily use are conveniently located, often on individual hooks and nails, and are all the ‘decorations’ the ‘simple’ spaces need , or in fact can take. Those things in secondary use or needing long term storage are in special storage cubicles whose forms define the house space proper – as well as being pleasant spaces in themselves. Here then, we find the basic necessities raised to a poetic level; the simple life well done. Cofferidge Close, Stony Stratford, Milton Keynes. 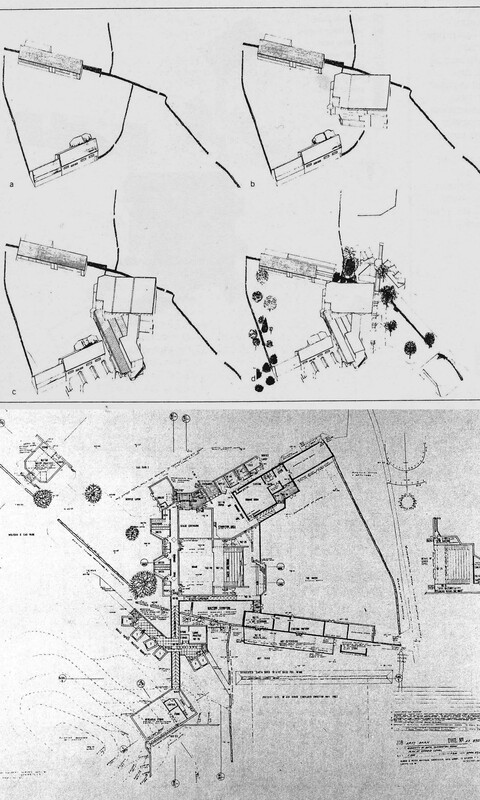 Cedric Price, Influential architect and theoritician. James Gowan's House, Hampstead, London. Birth and death of Newport High School 1972-2008.